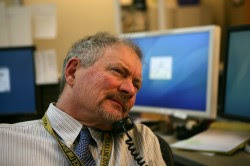 Dean Krakel worked with me at the Rocky Mountain News for almost the entire 17 years I was there. When I first met him, he was a photographer shooting a photo column called "Krakel's West." His photos and captions captured the modern American West and were collected in a book. He went on to become a photo editor and ultimately director of photography, working with Janet Reeves, who became the paper's senior editor for multimedia and photography. Dean wasn't just a visual journalist at the Rocky. He was also a writer and an adventurer, always taking off on rafting trips and other journeys, some of which he chronicled for the paper. Now he's planning on his biggest adventure ever. 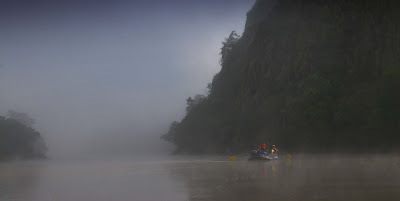 A trip down the length of the Omo River in Africa. I share his story as part of the series, "A New Life." At this time of wrenching change in the newspaper business, I hope it's encouraging for those caught in the storm to see that there's life after your newsroom has no place for you anymore. If you don't believe it, listen to Dean Krakel. "Imagine for a moment a river so mighty that it has carved out a 4,000-foot canyon of immense proportions, beauty and complexity, yet almost totally unknown except to a handful of the world's cartographers. Imagine, too, this river flowing for countless eons and yet so isolated from human affairs as to exist completely outside human history. Imagine all this and then give the river a name. Call it the Omo." - Richard Bangs, Sobek Expeditions. When I’m asked what it was like when the Rocky stopped publishing and what the closing meant for me I always have to take a long pause. The sorting out is not over yet. I’m still searching for answers. It may take the rest of my life to arrive at some kind of peace with what I find out. I was at the paper for over 20 years, starting out as a staff photographer and ending with a brief term as Director of Photography. I’m glad I didn’t get the jitters and leave early when it was announced that the paper would be sold or closed. There’s certain poetry in riding the rocket all the way down. Our last two days were among our best. Months before the paper closed my marriage of 35 years ended in divorce. In one fell swoop I lost two things I loved and two of the things that were the most stable in my life. I was in free fall for a long time and only recently has the wind quit whistling past my ears and have I found myself on a kind of ledge where I can breathe and look around. The first few months for me were filled with a kind of stunned disbelief, a wake-up-in-the-middle-of-the-night, heart pounding, breath-quickening panic. The divorce was financially devastating. Now I didn’t even have a job. I was in emotional tatters from two major life-changing events. What was I going to do? Where would the money come from? Would I lose the house? What about our boys, one in high school and the other just starting college? What about this? What about that? The age of 57 seems a little late to be trying to figure out what you’re going to be doing in life. During the last weeks at the paper I used to joke about taking a long vacation and going skiing all the time. Instead that sense of panic rolled me out of bed each and every morning as I immediately began looking for work. Since then I’ve cooked Chinese food for $8 an hour, cut trees for fire mitigation and began doing some freelance photo editing. The happiest thing for me is that I have once again started writing and taking photographs, skills that were placed on the back burner when I became an editor. I have always loved rivers. In times of trouble I have always turned to moving water for comfort and answers. Rafting or kayaking always seems to put things in perspective for me. Despite the cliché, it really is true, life is like a river. You learn to go with the flow, even if that means sometimes going upstream; life’s challenges are a bit like rapids, you study the current, pick your line and then paddle or row like hell. One way or another you usually come out the other side. So, what do you do when you love rivers, you’re divorced, unemployed, have very few prospects and are a bit undecided about your course in life? If you’re me, you buy a plane ticket to Addis Ababa in Ethiopia and join your friend Mad Max on a month long rafting trip down the Omo River. The Omo rises in the Simien Mountains and flows 621 miles to Lake Turkana in Kenya. It flows through one of the most remote and wildest parts of Africa. One of the last remaining true wildernesses on the planet. It is said that if Africa is the mother of all humanity then the Omo has been the main artery. The oldest known hominid fossil was found in the Omo Valley. Every African animal you can name, and some you can’t, call the Omo home. The banks teem with Hippo and Crocodiles. Well, teem may not be a good term. Yikes. But there are lots, okay. In Hippo Alley we may have to delicately navigate through as many as 200 of them. In the jungle canopy are amazing numbers of birds and monkeys. As many as 45 different tribes of people live along the Omo. Most have had limited contact with the outside world. On this trip we’ll be mainly interacting with members of the Bodi and Mursi tribes. The Mursi, historically, have been the fiercest and are known to the outside world by the fantastic clay plates that the women wear in their lips and the tattoos the men decorate themselves with to denote that they have killed an enemy. The first raft trip down the Omo took place in 1973. Only a few hundred people have been down the river since. Unfortunately our trip will be one of the last descents. A series of hydroelectric dams are planned on the Omo. One, the Gibe II, is scheduled to go online at the end of September, forever altering the river’s flow. We will have to portage our rafts and equipment, somehow, across this dam, now 98% complete. I’ve always admired the paintings of Karl Bodmer, one of the first artists to journey up the Missouri River to paint and sketch the wild places and people of the early west. His art remains the only record we have of a lost world. In late June, when Max, owner of Renaissance Adventure Guides, invited me to travel along with him on a trip down the Omo with his partner company in Great Britain, Water by Nature, I saw it as a chance to fulfill a dream and play Karl Bodmer. But I was totally undecided until two weeks ago. Going to Africa is expensive and rafting down the Omo doubly so. A huge leap for an unemployed guy with limited resources. The question I turned over and over in my mind was, "Could I afford to go?" But then the question became, "Can I afford not to go?" There won’t be any more Omo River as it exists now in the very near future. This is my chance to document the story of one of the last raft trips down a great free flowing river. My friend, Richard Murphy, Director of Photography at the Anchorage Daily News, helped me make the decision when he emailed me and said that if I lived a long life it would just give me all that much more time to regret not going and that the money I saved by not going would just allow people to drink expensive tequila at my wake. He added that when I ran out of money I could come live with him in Alaska. Today, two weeks from leaving for Ethiopia I sit in my house surrounded by ever-growing piles of photo gear and other equipment. But I find myself still torn. I’m leaving so much behind. The slight living I have been cobbling together. My sons. My life here. It’s a gamble, one of the greatest in my life so far, that I’ll be able to take a big leap to another continent and come back home with a good tale to tell the readers back home. It’s so foreign to me in some ways and yet again so familiar. After all that’s exactly what we did at the Rocky Mountain News. Dean Krakel can be reached at dkrakel@gmail.com. If you know of others whose stories I should tell as part of this series on journalists reinventing themselves, please let me know at jtemplermn@gmail.com. To read earlier installments of the series: ME Sprengelmeyer, Jay Bryant, Julie Hutchinson, Reggie Rivers. Dean--You're the man! Such courage in the face of adversity. Any chance you could blog from the river so we arm-chair adventurers back home could take the trip with you? Even if you can't post pictures from the Omo, I hope you'll do some kind of slide show when you return. I'd love to come down and see the shots and hear you talk about them. I'm sure the DAM or the Library would set you up with a room. Do you know about BHIM app se Money transfer kaise kare I just got an idea to do it. Not an easy thing to do with such competition in the market. An intriguing discussion is worth comment. I think that you ought to publish more on this subject matter, it might not be a taboo matter but generally people don't discuss these issues. To the next! I'll rehash, you needn't bother with credit, the supposed holly vessel to directing business with retailers, keeping in mind the end goal to be endorsed for a no credit check payday advance. Stunning content! Really I recommend your blog post. Now I’m for that reason content to read your articles. Now I’m excited for that so next vital and additionally revealing practice into your web page. Add-ons follow-up cash advance On the whole superior content! Training websites are turning into a methods for teachers, understudies, and instruction managers to cooperate more successfully than any time in recent memory. They are likewise an extraordinary asset for those hunting down the Best school in noida. You can get your body stress free and more energetic after taking the services with me. You will be satisfied physically as well as mentally. Hi ! This is very informative & interesting article.Nice to read your blog post first time ever. I really appreciate this post. Thanks for sharing this awesome post if you are looking for Financial planning for building a home please visit us.